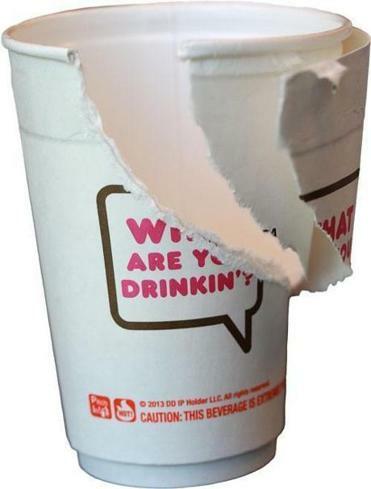 A Dunkin’ cup made of doubled-walled paper is being tested in Brookline, but critics say Starbucks and McDonald’s have done far more to help the environment. The Dunkin’ Donuts foam cup is so familiar to coffee drinkers — sold millions of times every day — that it even appears in the company’s logo. But Dunkin’ customers may soon find themselves drinking their coffee out of something new. The Canton company replaced its signature cup with a double-walled paper version at five Brookline locations Monday. The swap is taking place in anticipation of the town’s Dec. 1 ban on the use of disposable polystyrene, better known as Styrofoam, in packaging for food and beverages at food service establishments. The company has been criticized for using foam, a material that retains heat well but almost always ends up in landfills. Only small-size coffee orders are served in paper cups at about 7,400 Dunkin’ Donuts locations nationwide. The new containers are a very small step forward in the quest for a more environmentally friendly coffee cup, a movement led in the fast-food industry by rival Starbucks. The new Dunkin’ cups, which contain a plastic liner, address municipal Styrofoam bans but probably will not be recycled. “It’s a pretty weak response,” said Conrad MacKerron, a senior vice president at As You Sow, a national organization that presses companies on environmental issues and other corporate responsibility matters. MacKerron pointed to broad recycling campaigns initiated by Starbucks and a pilot program launched last year by McDonald’s Corp., which replaced foam coffee cups with paper alternatives in 2,000 fast-food restaurants, as much more aggressive efforts. For now, only one Dunkin’ Donuts in New York and two locations in Maine facing similar foam bans plan to follow the Brookline stores and switch to the new cups. Dunkin’ executives say they approach even small alterations to the iconic foam cup with trepidation. Hundreds of customers complained years ago when the company changed cup lids, replacing flat tops with the current resealable version. The company began testing alternatives to foam about seven years ago, looking for a cup that could be easily recycled and would maintain the same characteristics as foam. It examined everything from the internal and external temperatures of the cup over time, and how many times coffee drinkers shifted their cups from one hand to the other. In the latest round of surveys, consumers rated the Brookline cup best among five potential replacements. It was also the most environmentally friendly and cost-effective option that Dunkin’ has developed. The air between the new cup’s two paper walls acts as an insulator, and the plastic lining holds the liquid inside. But it is hardly the perfect replacement. The paper cup is warmer to the touch than foam. It does not retain heat as well and costs more to produce. And, like foam, it can be recycled but usually is not. The new cup’s plastic lining creates problems for some recycling centers. Johnny Gold, senior vice president of Newark Recovery and Recycling, said his company’s Fitchburg paper mill can handle only a small amount of cups with plastic liners when it pulps recycled paper in a giant blender. The plastic lining melts down and tends to clog screens. Even in Brookline, which approved the ban of foam last fall, Dunkin’s new paper cups will not be recycled. “We’re trading out one for the other, but not necessarily getting a significant improvement in our environmental footprint,” Murphy said. Nancy Heller, the Brookline Town Meeting member who proposed the ban last year, said the Dunkin’ paper cups will be burned because a recycling facility used by the town does not have the ability to break down the lining. “Still, it’s not as noxious to make and if it ends up in the environment, it’s not as toxic” as Styrofoam, she said. Murphy said Dunkin’ will continue to solicit consumer feedback on its new cup and fine-tune it until the Brookline ban goes into effect. He said Dunkin’ receives many pitches from scientists and budding entrepreneurs with new cup designs. A few promising options, such as a cup made from the same type of plastic as a water bottle, have led the company to pledge that it will find the perfect cup in the next three years. For now, the Brookline cup is a temporary solution. Murphy said the company has no intention of replacing foam cups in cities without Styrofoam bans until it can produce mass quantities of cups that are not only recyclable, but actually get recycled.